TEAM: Marcin Fejcak, Kalina Piłat, Paweł Lipiński (Ggrupa), Mateusz Frankowski (Ggrupa); JAZ+Architekci: Andrzej Jaworski, Julian Żmijewski, Zuzanna Masse-Deda; Tworzymy gry: Blanka Jarębska, Antoni Mirosław, Piotr Wiśnioch; COOPERATION: Marcin Krysiak, Monika Tymińska. 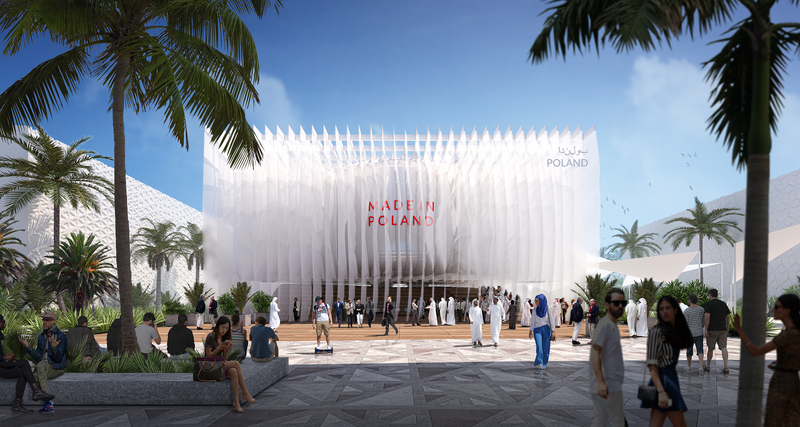 Pavilion – a showcase of Poland during the Expo 2020 in Dubai – is a presentation of experiences, technical possibilities and, above all, human potential. The contribution of man, his knowledge and skills releases the potential hidden in the elements, the elementary particles that make up the world. 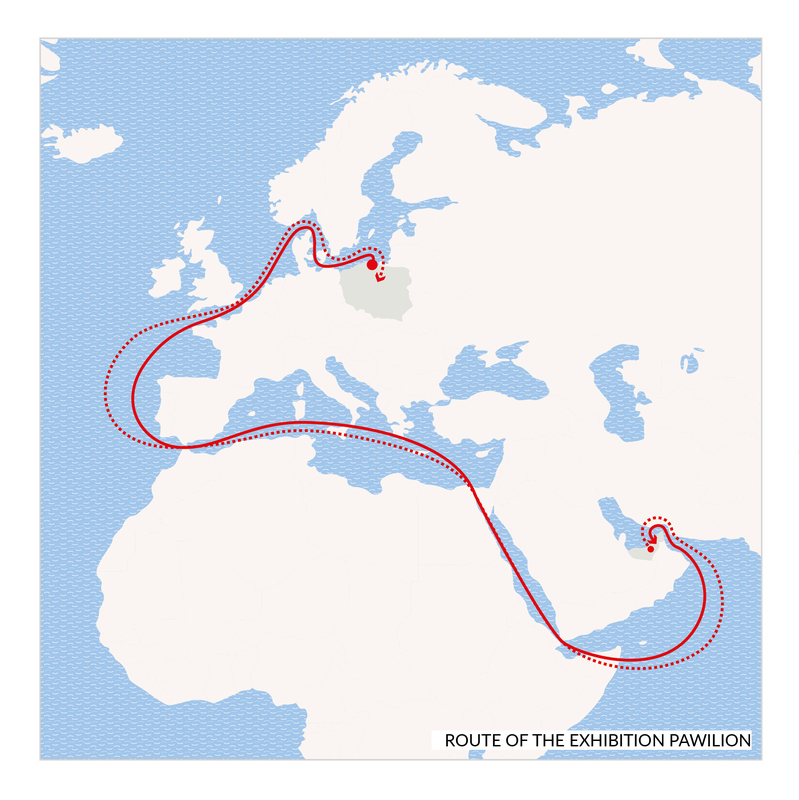 This is an idea that combines the history of Poland with the achievements of the United Arab Emirates. Dubai, now a modern and technologically advanced city, is a child of the genius of a man who, in the sands of the desert, was able to create the largest logistics and financial center of the region. Poland, a country not too rich in raw materials, with a serious geopolitical position, is thanks to human potential the cradle of graphene, it becomes an exporter of cosmic technology, an important link in the global network of precisive aerospace industry or digital technologies. The Made in Poland sign in many areas of the economy is a testimony to craftsmanship and the highest quality. 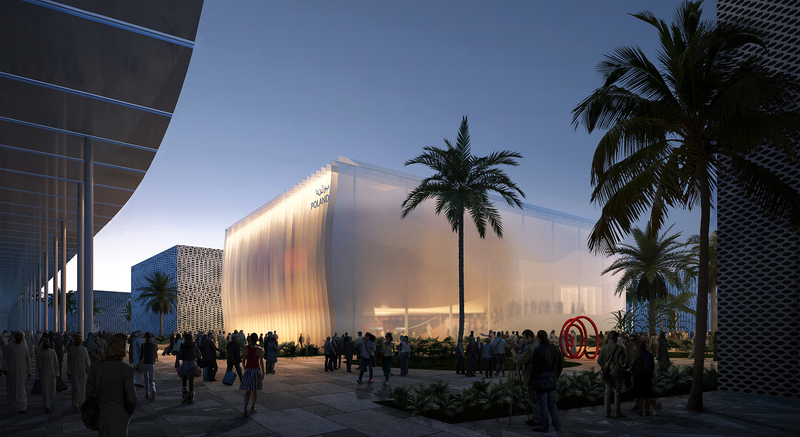 This is a simple slogan – a symbol should become the motto of the Polish Pavilion EXPO 2020. 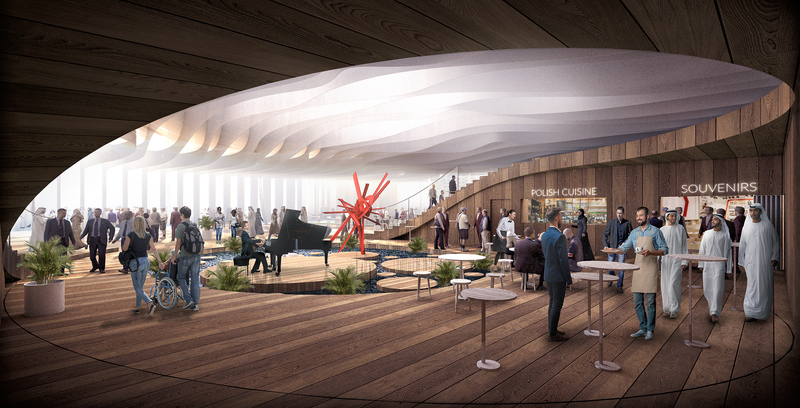 Produced in Poland or created in Poland is the main message addressed to the guests of the Polish pavilion. A strong and symbolic component of this message is the fact that we produce elements and modules of the pavilion in Polish yacht yards, and then we transport them to Dubai by sea. Dubai, like Gdańsk and Gdynia, is a window to the world for its countries, and the sea is a natural connection between Poland and the UAE. Yachts built in Polish shipyards are also the best and recognized ambassador in the Arab world that Poland can offer to the world. 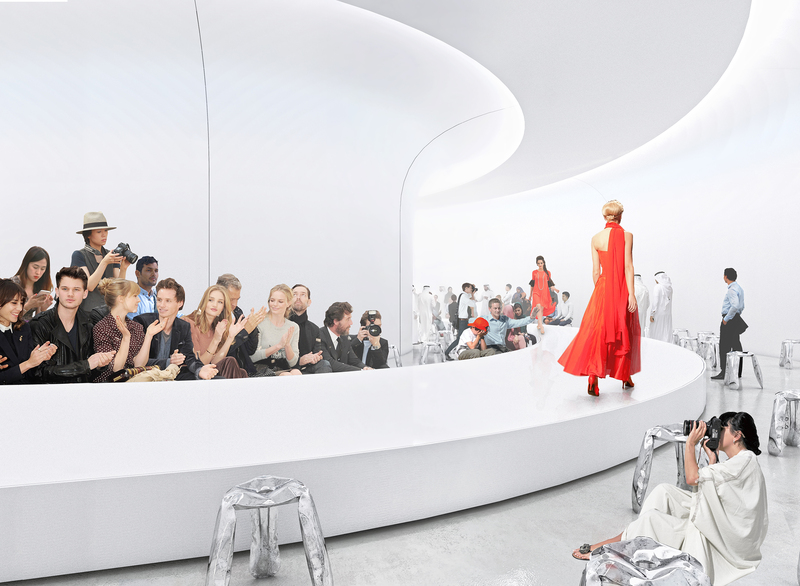 A luxury yacht – a symbol of the Polish brand, precision, and technological ideas – has become a direct inspiration for the form of the entire pavilion. Symbolic hull suspended in a cloud of contemporary, bright canvas creates a peculiar tent in the shape of a rectangular prism. The sails are in constant motion, and the parallelism of their planes gives movable observers a sense of constant movement of the pavilion itself. 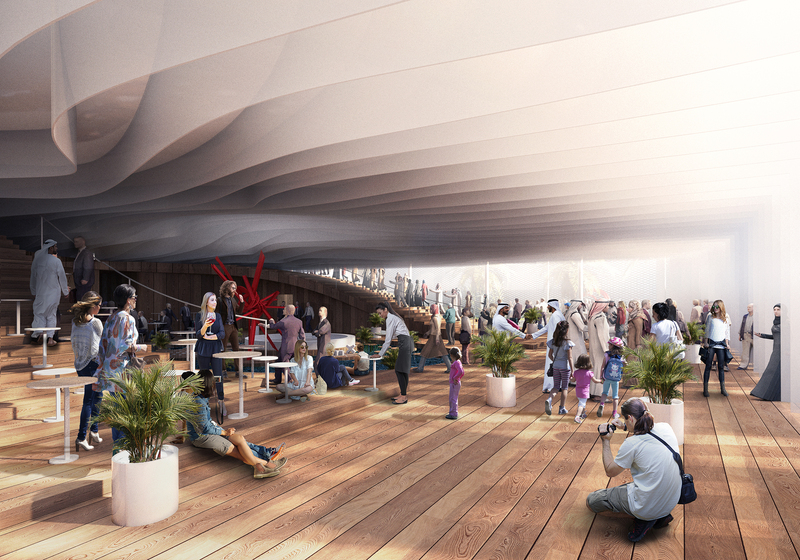 The motto of Made in Poland is dynamically emerging from the sails during the passage to the pavilion. At the same time, its walls, seen at an acute angle as closing and full, become at some point openwork and open the entrance to the interior of the object. The viewers are accompanied by the impression of constant movement and pulsation of the object that passes through. 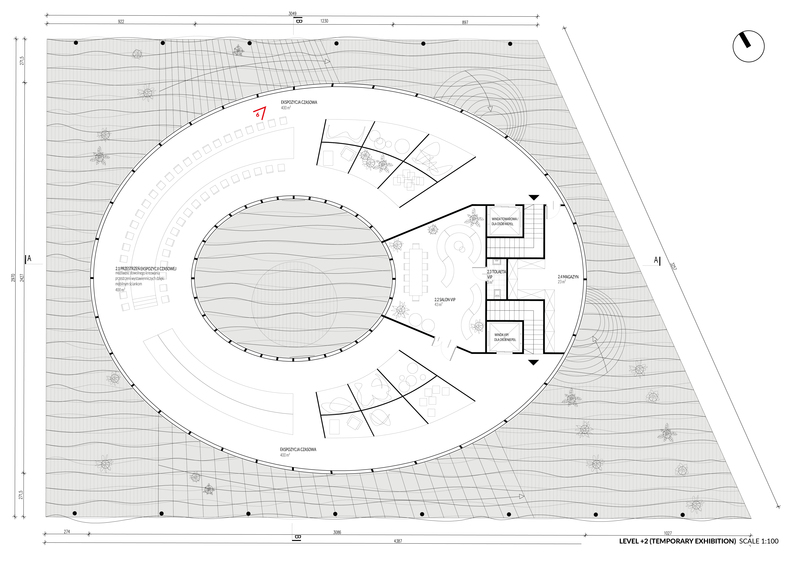 The structure of the sails and the composite shape suspended in them are placed above the wooden floor, which, like a carpet, insulates from the ground, and conceals the entire set of functions serving the pavilion. In the interior, it evokes not only associations with the boat deck but above all with the rug – an indispensable part of the refuge of the nomadic Arabians. In the center of this carpet, there is a large pool with the stage located in its center. 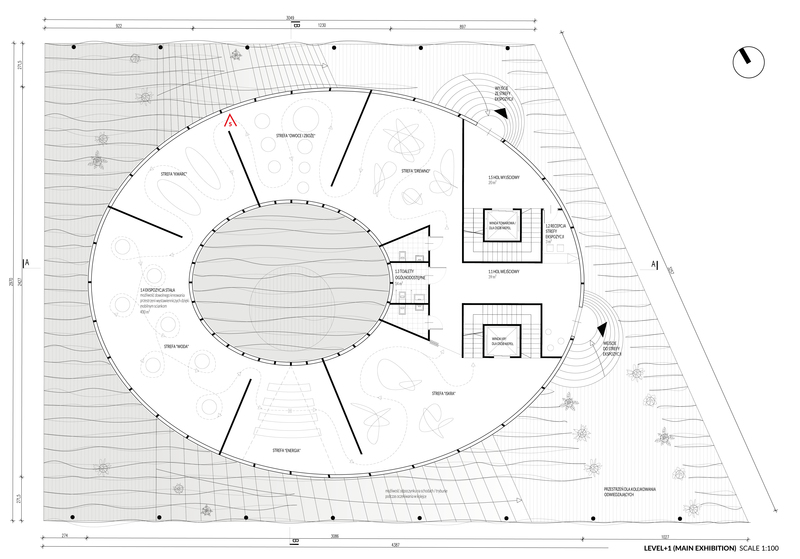 This is the heart of the pavilion, the visible place of concentration of internal life, and the element of the interior cooling system, based on traditional solutions used in this climate zone. 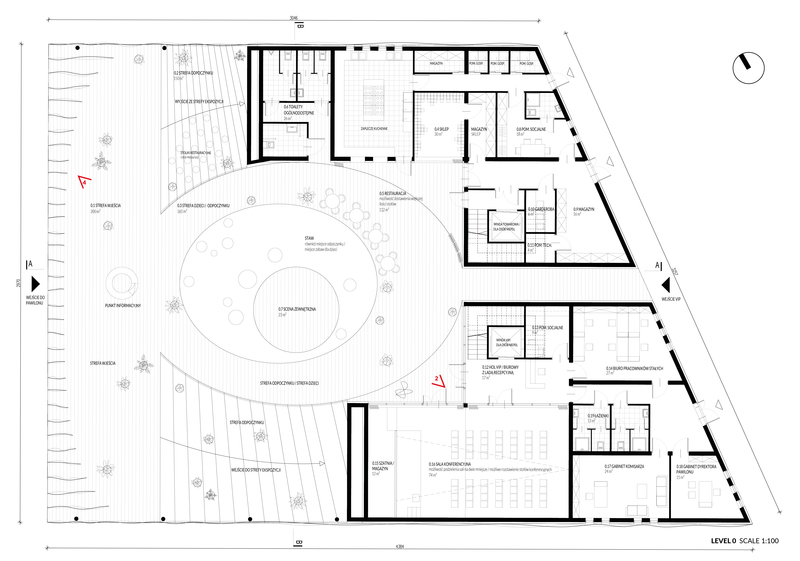 A clear reference to the local culture is to put all public functions together, in the most accessible space, and at the same time completely open to all guests. 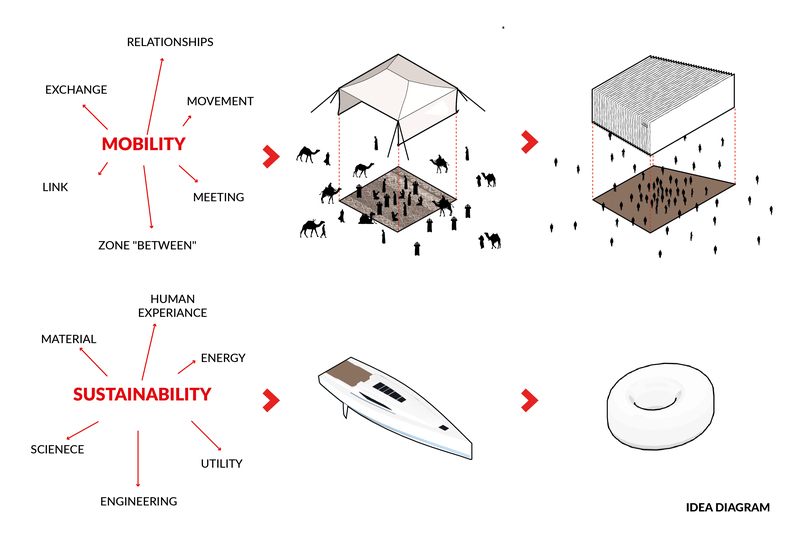 As in the Bedouin tent, the carpet and the roof are only partitions that give space for a friendly contact between people. 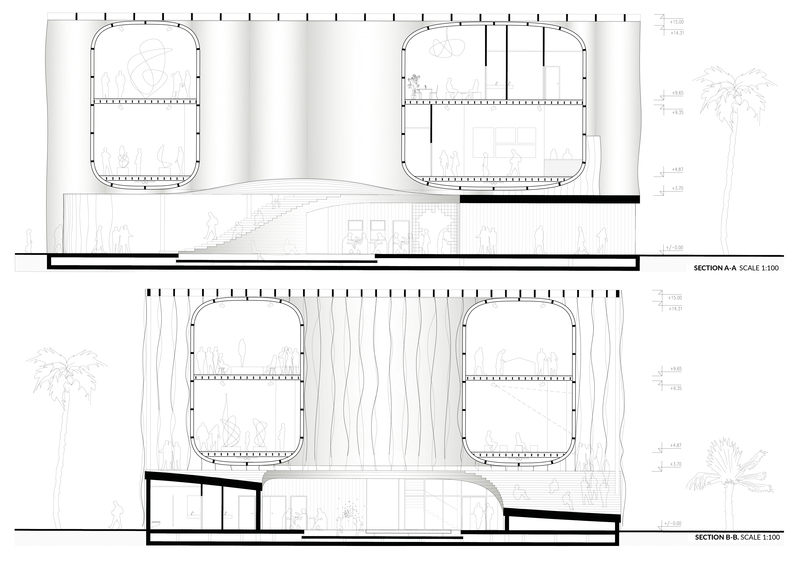 The space of the pavilion’s foyer opened in this way has a place that pulsates with continuous life and creates conditions for building relations between the hosts and guests. 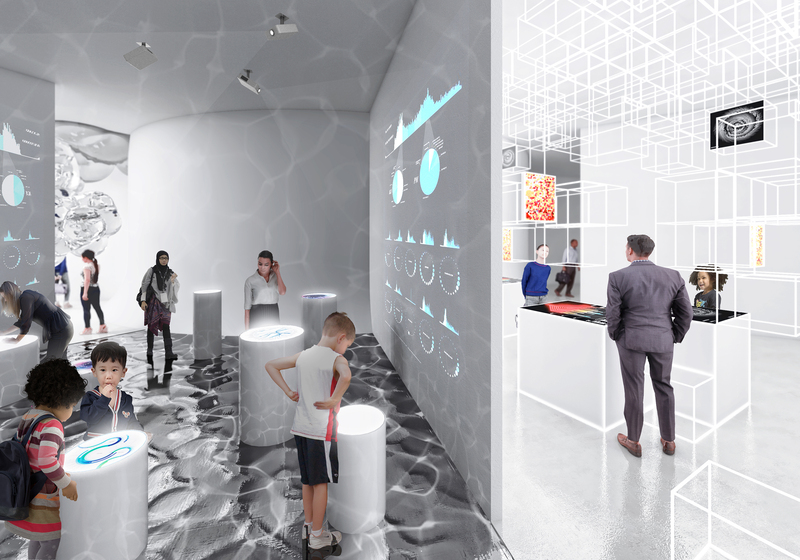 It is the heart of the Polish pavilion, whose character is strongly rooted both in the local culture of bazaars – the centers of community life, and in the Polish identity as a country of meeting people. Poland, once and now, is a zone of intersecting trade routes and routes of communication, this place between the areas of cultural influence, the suspension between tradition and modernity, the point between East and West, between global and local, and between civilization and unpolluted nature. Poland is a “between” zone – a natural place to meet and exchange. 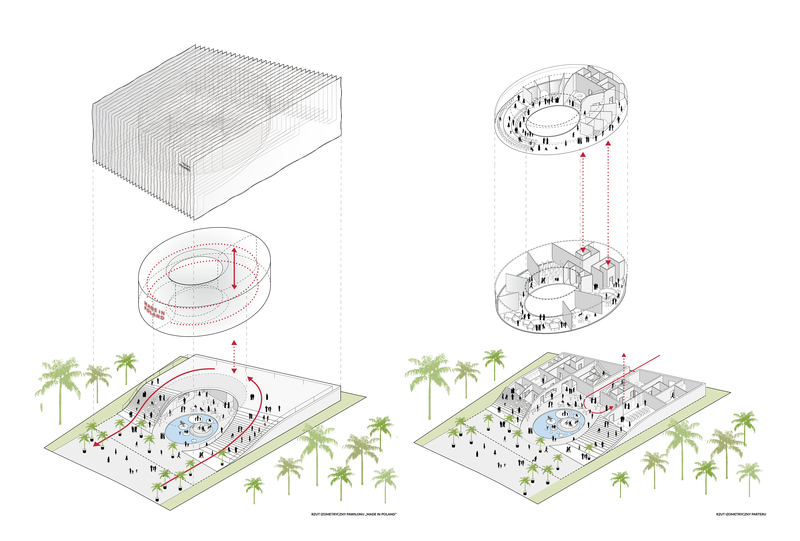 Both slogans: mobility and sustainable development, chosen by the organizers of the Polish pavilion, are interpreted in the pavilion on many levels. Mobility is not only a movement and the ability to move but a basis for development on the exchange of thoughts between people, creating conditions for mutual communication and building relationships. Sustainable development is not only about the ability to apply hi-tech and low-tech solutions for user needs, it is not only about resource-efficient management, but also about using the existing potential of Polish companies and creating a temporary, reusable facility.